I have no clue where the original recipe came from as I have been working off a photocopy for years now. Let eggs stand at room temperature for 30 min. While eggs are coming to temp, preheat oven to 350 degrees and prep pan. To prep the pan, grease the bottom and sides of a 9" springform pan. Line bottom with parchment paper; grease paper. Sprinkle the bottom and the sides of pan with granulated sugar; dust with flour. Set pan aside. In an extra large mixing bowl combine eggs and 3/4 c sugar. Beat with an electric mixer, on high speed for 15 minutes. After the 15 minutes, and with mixer still running, gradually add the oil in a thin, steady stream (this should take about two minutes). Turn off the mixer immediately after all the oil has been added. Sift the 1 1/4 c flour over the egg mixture and fold in until no lumps remain. Pour into prepared pan and place on baking sheet. Bake for 30-35 minutes, until the top springs back when lightly touched, Cool cake thoroughly in pan on a wire rack. I frequently serve this with whipped cream and fresh strawberries as it is similar to a sponge cake. 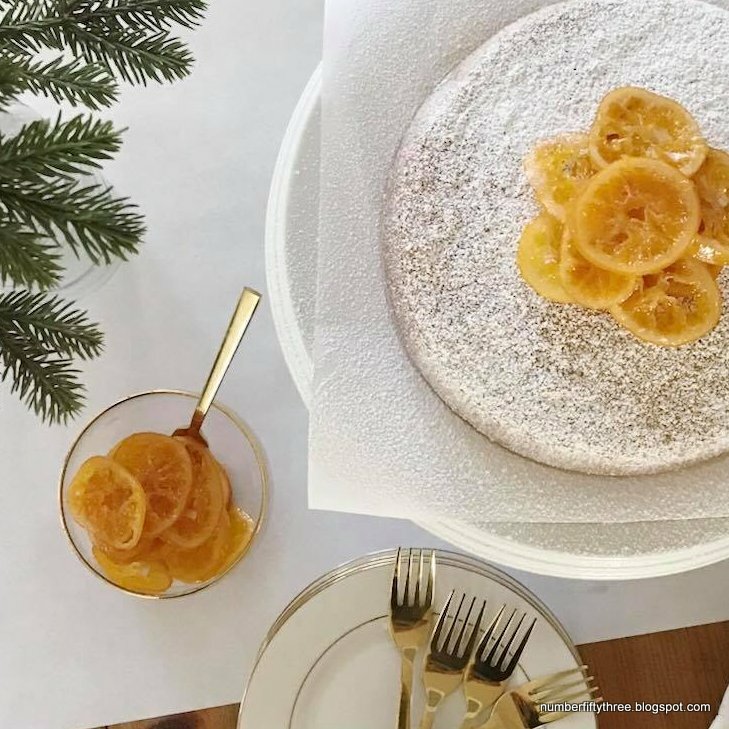 For this holiday season though, I decided to serve it with freshly candied oranges. These were very simple to make and I used this recipe.